Are you interested in working in a consulate overseas as a diplomat, or become a political officer who can offer advice on international issues? A career in the Foreign Service may be for you. The first step in that process is taking the Foreign Service Officer exam, a challenging test that contains four areas that test a candidate’s knowledge, skills and abilities in several areas. This guide examines the Job Knowledge portion of the test, which contains questions on a wide variety of topics. It also provides information on an excellent study guide to help you prepare. What are the eligibility requirements to take the Foreign Service exam? Candidates must be a U.S. Citizen between the ages of 20 and 59 at the time they register to take the exam. The exam is offered three times a year over a one-week period generally in February, June and October. Candidates can register to take the exam approximately five weeks prior to the test window. A private testing company that has offices throughout the United States delivers the exam. Candidates can also take the test on certain military installations. Is there a fee to take the exam? Yes. There is a $5 fee associated with the entire Foreign Service test. Please make sure to arrive at least 30 minutes before your scheduled test time. You don’t want to be late and risk being disqualified from taking the test. How many questions are on the Job Knowledge portion of the Foreign Service exam? There are 60 questions on this portion of the exam. The Job Knowledge portion of the exam is 40 minutes. What questions are on this test section? The Job Knowledge section contains a wide range of questions in several content areas. Those content areas could include government and history of the United States, world affairs and economics. This section of the test could ask international affairs questions, testing candidates’ knowledge on the Gulf of Tonkin resolution and what it authorized, and what international maritime pathway Iran controls based on the country’s location. Questions could also test a candidates’ knowledge of tax policy, technological terms, and international affairs. In addition to the Job Knowledge section, candidates will also be tested on Situational Judgment and English Expression and asked to write an essay. What identification will I need on test day? Please bring a valid piece of government or state-issued identification. Can I bring personal items into the test area? No. Candidates are not allowed to bring mobile phones into the test center and will be asked to remove sweaters, jackets and the like. Candidates will receive their test results about two weeks after the close of the test window. 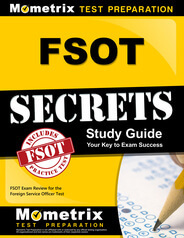 What if I fail the Foreign Service Officer test? Can I take it again? Yes. Candidates must wait 12 months to retake the test. There is no limit to the number of times a candidate can take the exam. I’ve passed the test? Does that mean I’m on the Foreign Service? No. The exam is the first step in the State Department’s eight-step program to becoming a Foreign Service officer. Candidates still must submit an essay, take an oral assessment, obtain a medical and security clearance and undergo a panel review. After that, candidates can register in the Foreign Service. But passing the exam is the first crucial step, which is why candidates need the best study materials they can get. So, what are the best study tools I can obtain that will prepare me for this test? 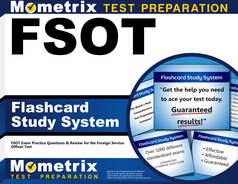 Mometrix has an amazing array of study materials that can you prepare for this important step. As noted above, there are 60 questions on the test and only 40 minutes to complete them, so you must think fast. Our study guide contains a step-by-step video tutorial and walks candidates through test areas that tend to give test takers difficulty. Our flashcards help candidates’ study on the go. In both cases, our study materials provide easy-to-understand answers to difficult questions you’re likely to confront on this test. That’s why you need the Mometrix study tools.